Jose Acevedo, a 43-year-old undocumented immigrant, is accused of driving drunk without a license in a crash that injured two people in Auburn, Massachusetts. Police say a drunk driver without a license who caused a crash that injured two people Thursday in Auburn, Massachusetts, had already been arrested earlier in the day. According to Auburn police, the crash took place at the intersection of Route 20 and Mill Street around 4:45 p.m. The second car was carrying a family of four. Both adults were injured, including the mother, who suffered a broken neck. Police initially told NBC Boston that the two young children in the car were injured, but it has since been learned that only the parents were hurt. 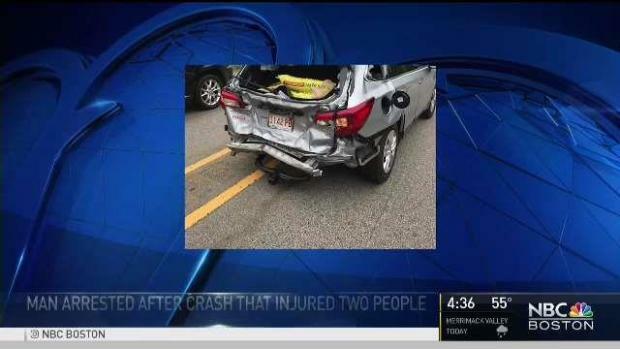 Police say a drunk driver without a license who had already been arrested earlier in the day caused a crash that injured two children and an adult Thursday in Auburn, Massachusetts. The driver of the first vehicle, 43-year-old Jose Acevedo, was arrested at the scene. Police said his blood alcohol content was three times the legal limit. NBC Boston's Investigators have learned that Acevedo had already been arrested earlier in the day by Worcester police on a warrant for operating without a license. The Auburn charges against Acevedo include operating under the influence causing bodily injury, negligent operation and unlicensed operation. According to police, Acevedo also admitted to being an undocumented immigrant from El Salvador. An investigation into his citizenship status is ongoing. Acevedo was arraigned Friday in Worcester District Court. It was not immediately clear if he had an attorney.